Vodka Diaries Review: A film so bad that it leaves no hangover whatsoever! Read its in-depth review of Kay Kay Menon’s latest film Vodka Diaries on BollywoodMDB before booking your tickets. After spending his holidays with wife Shikha Dixit (Mandira Bedi), ACP Ashwini Dixit (Kay Kay Menon) returns to Manali to resume his duty. The moment he enters the city, he is welcomed with the news of a series of mysterious murders happening across Manali. One thing is common in all the murders - that they are somehow connected to a popular city nightclub, Vodka Diaries. Will Ashwini be able to find the motive behind all the murders and catch the killer? Is there more to things than meets the eyes? To know, watch the film. Kay Kay Menon is a brilliant actor and the only saving grace of the film. Though it could not be called his best performance in any way, he somehow manages to sail through in this poorly written film. But we still wonder what made him say yes to the movie which has nothing great to offer at all . Mandira Bedi plays a small but vital role in the movie and she pulls it off well despite looking very tired in some scenes. Raima Sen and Sharib Hashmi are totally wasted. Kushal Srivastava has directed the film from a script written by Vaibhav Bajpai. No matter how talented a director is, if the script of the film he is helming is powerless, he cannot do anything about it. Srivastava is totally handicapped by a weak script that lacks the fizz. Besides the story, the screenplay of the film is also very hackneyed. The film has been shot in a city as beautiful as Manali. In spite of that, the cinematographer just fails to capture the breathtaking beauty of the landscape through his lenses. Barring a few scenes, the film looks very dull throughout. Editing is another area where the film falls flat and so is the background score. Production value of the film is decent, though. Like most of the things in the film, music of Vodka Diaries is also bland. There are three songs in the soundtrack but, much to our disappointment, none of them is good enough even for a single listen. Thankfully, not all the songs are included in the movie. You can easily skip the film even if you admire any of the actors related to the movie. In the name of a psychological thriller, Vodka Diaries turns out to be a film that hits your senses mercilessly. Arbaaz Khan’s ‘Nirdosh’ pushed a week further, to now release on 19th January! 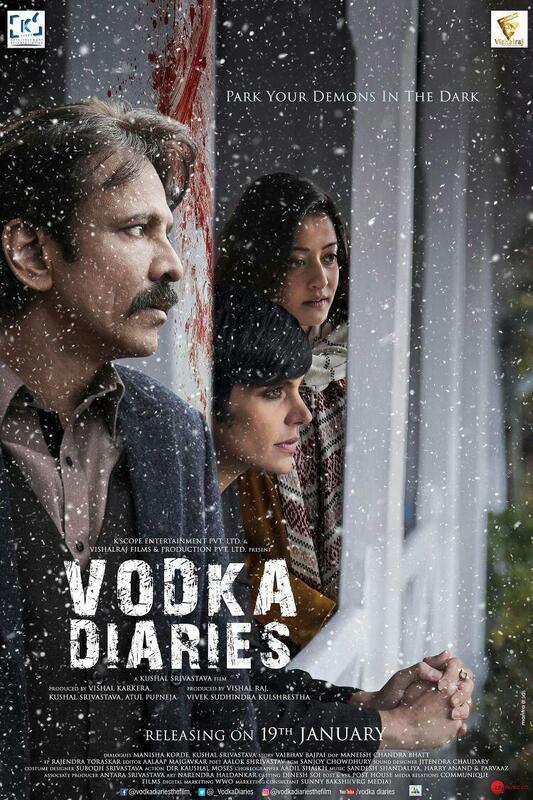 Here is the first teaser poster of Kay Kay Menon’s upcoming thriller, ‘Vodka Diaries’!